For those under the age of 40, this time before Christmas might be a good time to mention that Madonna has been around for a long, long time; she isn’t British; she is not a pop singer; and she is doubtless one of the world’s best known mothers. That being said, the Italian term Madonna, which was previously used as a form of address for a lady (now replaced by Signora), is one of those stretchy artistic terms that a painter can apply to a work of a mother and her child, usually the Virgin Mary and the Christ Child, but this being the 21st century, we find ourselves with freedom and flexibility to playfully play with words. The setting for this portrait is the living salon of the Hughes House, an historical Victorian era home on the southern Oregon Coast. Where this modern mother and her rambunctious child now enjoy a moment of peace and temporary quiet, a large Irish family of dairy farmers once settled in for an evening’s rest by the light of a kerosene lamp and a coal fire. Life marches on. Mothers hold their children. Children grow up and have children of their own. The bond between parent and child passes from generation to generation. 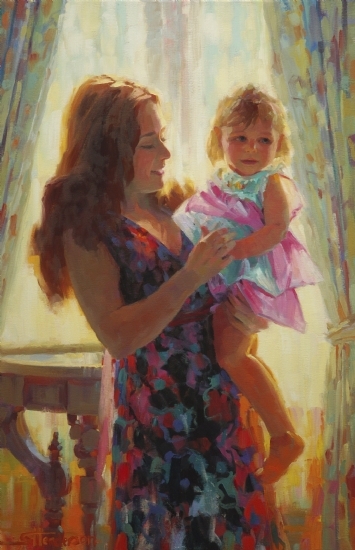 Madonna and Toddler is available through the artist at Steve Henderson Fine Art Online Gallery. Through the holiday season and into the new year, Steve’s works are in special shows at Samarah Fine Art, Whitefish, MT; Planet Bronze Gallery’s Holiday Miniature show, Bozeman, MT; the Maritime Museum at Mystic Seaport, Mystic, CT; and Rive Gauche Galleries, Scottsdale, AZ. More original artwork by the Norwegian Artist is available for view and sale at Steve Henderson Fine Art Online Gallery. Steve’s work is also available at Rive Gauche Galleries, Scottsdale, AZ and The Lawrence Galleries, Sheridan and Gleneden Beach, OR.